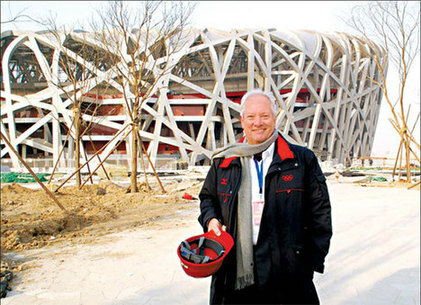 Ric Birch in front of the National Stadium, also known as the Bird's Nest, during one of his trips to Beijing. Olympic Games ceremonies maestro Ric Birch is leading a creative workshop in Beijing and his young Chinese students are hanging onto his every word. The Australian asks about the biggest change since China's opening up policy and economic miracle. "Now you can buy bicycles in any color," one young man innocently explains. "Before, bicycles were black, gray or blue but now there's yellow and orange ... any color you want." Birch did not see that answer coming, but says it reveals the baffling complexity of the Chinese mindset, which Western critics often fail to understand. "I often think of this when I hear a Western commentator making pronouncements about China - the reality is that significant change takes longer than one generation," Birch says. "The fact that China has achieved so much in one generation is so extraordinary that we can't compute it. There has never been an equivalent, so we don't have any bench marks." Birch, the brains behind the largest and some of the most successful live productions ever mounted, says all these issues of rapid change will "come together for me" in the Beijing Games opening ceremony. Birch is in the Chinese capital this week once again, as advisor to Beijing ceremonies ringmaster and legendary movie maker Zhang Yimou. Dress rehearsals will begin on June 10.